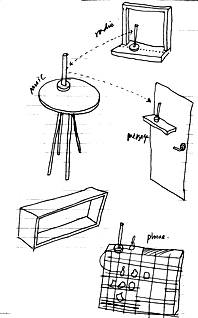 Develop and validate an architectural style for tangible, communicating artefacts (=a Gadgetware Architectural Style (GAS)). Design and develop an infrastructure and sample artefacts enabling the architectural issues and the GAS evaluation. GAS is a generic framework shared by both gadgetworld designers and users. Extrovert Gadgets are objects with communicative abilities. 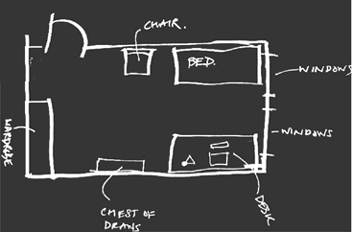 The objects and/or their environments can be enhanced by intelligence. A multitude of loosely coupled gadgets can be bound into ad-hoc interacting clusters which display collective function, thus forming a gadgetworld. 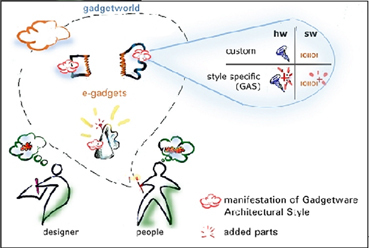 creating a generic Gadgetware Architectural Style (GAS), deciding the degree and locus of "intelligence" and enabling the new emerging behaviour of gadgetworlds (as they are configured by end-users). e-Gadgets will conclude on the value of the idea, and will accordingly provide guidelines on the development of other styles for various application domains. As part of addressing the issues related to the disappearing computer, e-gadgets has co-organized the "cognitive vs physical dissapearence" workshop during the i3 spring days 2001 (April 25, Porto).